European Antennas Ltd has achieved rapid, steady growth since its formation in 1991. 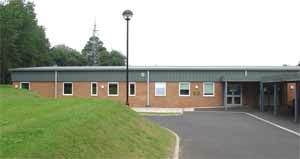 The result of this success has meant the employment of more people and the need for more space. Rather than relocate, the company has commissioned a new 6000 sq ft building to be built adjacent to its existing premises on their 3 acre site situated on the outskirts of Cheveley, near Newmarket. Costing in the region of £800,000, the new building (to be named the Electron Building) will house additional production and administration facilities and will also allow for the expansion of the research and development laboratory. The new building has been designed to be in keeping with the area and is to be constructed to the highest modern standards. The original structure, built in the 1930s and known locally as 'the old radio station' will continue to be improved and modernised as part of the company's ongoing development. In the meantime, managing director Brian Phillips and staff of 45 people celebrate the start of the new building works. European Antennas Ltd are planning a 'house warming' when the new building is complete and Brian Phillips would be pleased to hear from anyone who used to work in their older building, particularly during World War 2. The company heard from many people who had worked in the old building going right back to 1940. 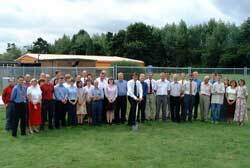 Many of them were able to join the directors and staff for a celebration of the completion of the new Electron Building on 6 June 2001. Below, building and renovation completed.